In response to customer demand, Hummingbird Electronics is pleased to offer an in vehicle data-logger with integrated GPS and crash detector. The data-logger will typically be used to monitor vehicle parameters or reconstruct incidents. Integrated GPS provides position, speed, acceleration, deceleration, heading and also allows all data collected to be accurately time-stamped. The integrated 3-axis accelerometer can measure forward/back, left/right and up/down forces and can be used to calculate pitch and to detect impacts. The data-logger can collect samples at a constant rate of 10 per second (10Hz), although this can be decreased by the user if required. If an impact or rollover is detected, the previous 4 seconds and subsequent 2 seconds of accelerometer data will also be stored at 200Hz to allow for incident re-creation. All data collected is stored to a secure SD-card in a separate file for each day. Files are erased after 30 days. The data format is such that it can be ready by most popular spreadsheet programs on a standard computer. Data can also optionally be downloaded via serial or RF (an additional PC modem will be required to use the RF download option). A serial or RF interface optionally allows users to configure parameters such as overspeed thresholds, pitch and roll incident levels and accident thresholds. Additionally, other parameters such as sample rate can be configured remotely. An internal buzzer and optional LEDs provide status information to the user. LED 1 flashing or a single beep every 30 seconds indicates loss of GPS lock. Three beeps indicates that the SD card is not functional. Other outputs are available for overspeed and tilt warnings. 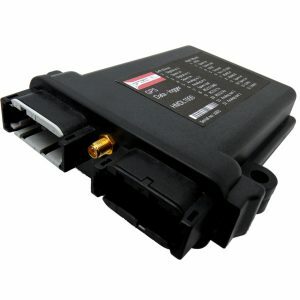 The data-logger is provided in a watertight enclosure with a Deutsch plug for interface and power. Provision for screw mounting when required is provided. The unit should be mounted horizontally with the screw mounting plate down and the cable to the rear of the vehicle. A magnetic mount antenna is supplied as standard. Other antenna types are available on request.